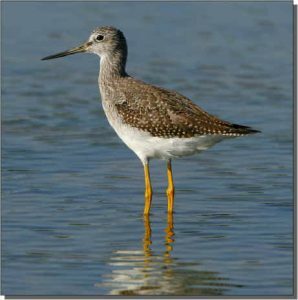 Description: Greater Yellowlegs are dove-sized birds with a relatively long, dark bill which may be slightly grayer at the base, a white eye ring and long, yellow-orange legs. Long wings protrude past the tail when standing. In breeding plumage, they show black markings on the back, breast and sides. The black markings are replaced by gray plumage during the nonbreeding season. Yellowlegs in flight have a distinctive dark body which contrasts with a square white rump and pale tail. 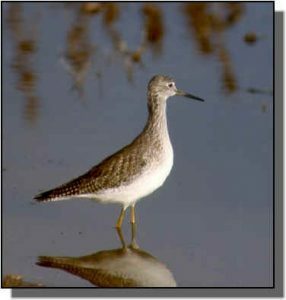 Similar Species: They are distinguished from Lesser Yellowlegs by a larger body and heavier, slightly upturned bill which is 11/2 times the length of its head. Greater Yellowlegs tend to feed singly or in smaller groups and in deeper water. Listen for a three or four-note call versus the two-note call of the Lesser Yellowlegs. Willets are larger, have a stockier appearance and blue legs. Solitary Sandpipers are smaller, usually with greenish legs and darker backs. Comments: Greater Yellowlegs are active feeders, often seen running or striding quickly while jabbing at food on the water surface. They breed in the taiga of central Canada and Alaska. The nonbreeding season is spent in coastal areas of southern North America and throughout Central and South America. They are seen in loose flocks during migration throughout the Great Plains.